What do chefs want from their combination oven? They want them to be easy to use. And they want them to cook more food, provided it doesn’t compromise quality. Lainox has launched an upgraded version of the Naboo combination oven that delivers on both counts. The Lainox range is distributed in the UK by Falcon Foodservice Equipment. The ‘reloaded’ Naboo looks much the same on the outside – which is a good thing, since it’s one of the best looking combis around. What’s different is on the inside. Firstly, the software controls have been upgraded. One key area is getting to the cooking mode – lots of chefs prefer to use their combination oven in one of its three ‘straight’ modes: convection, steaming and combination. All three can now be found on the control panel’s home page, so chefs can just tap the screen and go. When it comes to productivity, Naboo’s Multilevel and Just-in-Time cooking features are popular with customers. Both make it easy for chefs to cook different products at the same time, by having the oven’s intelligent recognition identify which recipes can be cooked together. The software monitors each shelf individually, alerting the user when it’s time to put an item into the oven, and when it’s time to take it out. The new Naboo’s software can monitor two different recipes on each shelf, effectively doubling the different types of foods that can be cooked simultaneously. 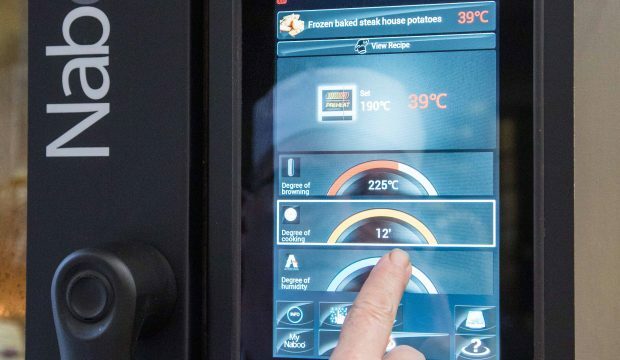 A key advantage with the Naboo is its connectivity, which gives users internet access to the Lainox Cloud to manage their oven’s operation and recipes. Changes can be made on a central computer and then synchronised to an oven, or multiple ovens across multiple sites, simultaneously. When connected to the Cloud, the new Naboo will automatically synchronise at regular intervals, ensuring any changes the user has made to the oven are saved. The connectivity also gives users access to thousands of recipe ideas and tips, direct from the oven’s control panel.